2015 hat Bucci 3 Hündinnen gedeckt. 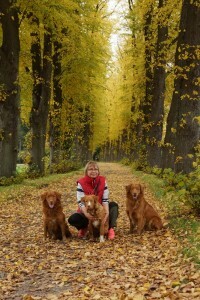 Desire of Red Glory “Jillz” aus NL, Objibwa’s Yiska BaQa “Yiska” aus der Schweiz und Forestrunners Ayascha “Yascha” aus Bayern. Aus der ersten Verpaarung haben wir eine kleine Hündin genommen, Martinique of Red Gory “Nicky”. Sie gefiel uns optisch, vom Wesen und schien auch gute Arbeitsanlagen zu haben. Somit hoffen wir, dass sich unsere Hoffnungen erfüllen und sie gesund ist. Wenn sie allen unseren Erwartungen gerecht wird, soll sie in die Zucht gehen. 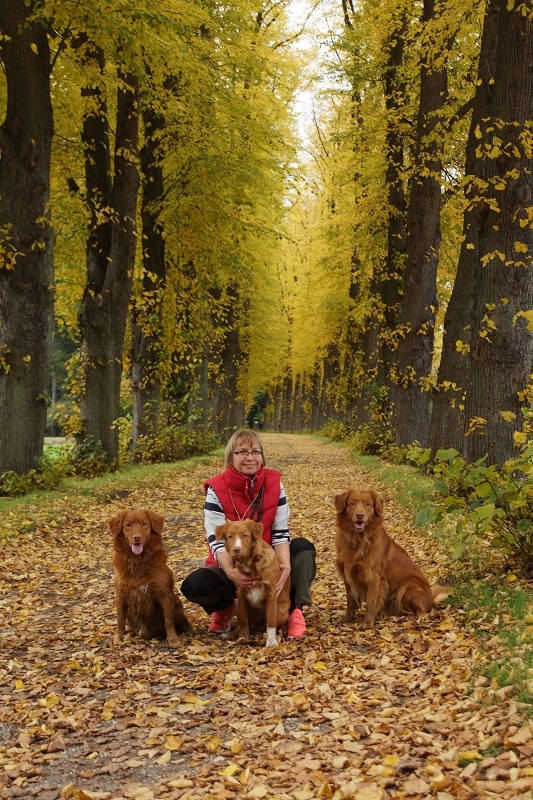 We are Birgit and Johannes Winkmann with our Tollers Bucci and Vigno and our mix dog Bijou and our 2 cats Luna and Sunny. In 2001 our first dog moved in. Fourwind Cottage Tara, a golden retriever. She was 8 weeks old and like a whirlwind. I had to learn to deal with it. The training became more fun the better it worked out. In summer of 2002 our Bijou moved in. She is a spanish sheepdog crossbreed. She knew nothing and was so different to Tara. Always uncertain and unfortunately often anxious. With this I had to learn again, now in a completely different direction. With those two I worded in Dogdance but tried obedience and agility also. Eventually, I saw a my first Nova Scotia Duck Tolling Retriever at a dog club. Even Johannes, who until then was more of a cat fan, found pleasure in this race. We quickly agreed that the next dog would be a Toller. After Tara had to leave us far too early I was heartbroken. I searched for a Toller in the german Retriever Club (DRC). Coincidentally one breeder had a puppy left. After emailing and a long phone call I quickly had the feeling being in right hands. A visit was organized in Gröbenzell, Bijou accompanied us. We got the commitment and are almost gone home happy. 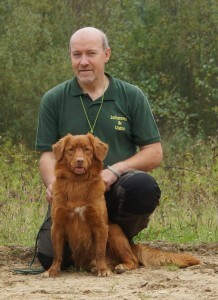 In autumn Bucci, the Buccaneer High Spirits Toller, moved in with us. I was pleasantly surprised, because Astrid Jurksch, the breeder brought him to our house. Bucci has accomplished something that the girls never did. He wrapped Johannes around his paw. We already fought almost about the little red guy. At a kennel meeting Astrid demonstrated us the dummy work. We were both fascinated. Until then, we had no idea of this sport. The distance control and the diversity were very impressing. Johannes wanted to work in that sports as well and the wish for his own dog was growing and growing. Thus we agreed that Johannes will get his own dog. Astrid was just planning a litter. We were very fortunate to met her, the decision was quickly made. Another puppy from Astrid. The small Vigno, Captain Tavignano the High Spirits Toller moved in 01/04/2012. A little April Fool’s joke. He also conquered Johannes heart by storm. So the dogs are our shared passion. We are now often traveling together, visiting exhibitions or taking exams or just having nice tours. Bucci had 3 litters in 2015 with Desire of Red Glory “Jillz” from NL, Objibwa’s Yiska BaQa “Yiska” from Switzerland and Forestrunners Ayascha “Yascha” from Bavaria. From the first litter we took a little girl. Martinique of Red Glory ” Nicky”. We liked her optical and from character. Also it looked like she love to work. So if all goes well and she is healthy, we want breed with her in the future.